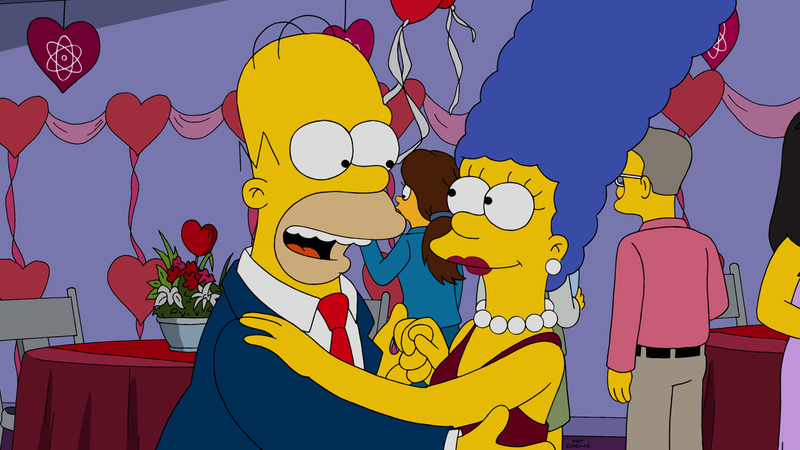 Description and photos from the Simpsons episode "Love is in the N2-O2-Ar-CO2-Ne-He-CH4"
Tonight on The Simpsons, “Love is in the N2-O2-Ar-CO2-Ne-He-CH4.” Or, in other words, love is in the air. In the episode, lonely Professor Fink uses science to turn himself into a man whom women find attractive. Then, overwhelmed by the attention, he invents an algorithm to perfectly pair the lonely men and women of Springfield, realizing that scientific exploration is his true love. Meanwhile, Marge, Bart, and Lisa visit Grampa for Valentine’s Day and try to rescue the old folks from a drug-induced hallucination that allows them to relive their happiest memories. You can see a few photos below. The Simpsons voice cast includes Dan Castellaneta as Homer Simpson; Julie Kavner as Marge Simpson; Nancy Cartwright as Bart Simpson and Nelson; Yeardley Smith as Lisa Simpson; Hank Azaria as Moe; Harry Shearer as Skinner; Tress MacNeille as Dolph; and Pamela Hayden as Milhouse.